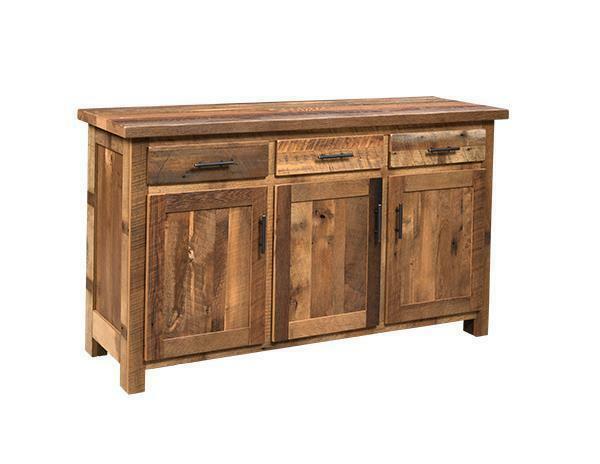 The Edinburgh Reclaimed Barn Wood Buffet Server makes a great addition to any dining room furniture collection. Handcrafted from the wood of hundred year old barns that have been torn down and given new purpose. This process of creating reclaimed wood furniture helps to support the sustainability of our planet and is a great way to keep the long history of these farm country barns alive with a new life where they can be enjoyed by others. This beautifully crafted buffet server is the perfect example of the new memories that will be created on top of the existing history engraved into this reclaimed Barn Wood Server.